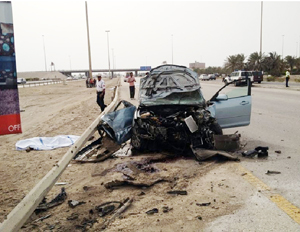 Joel's Jottings: Highway Deaths in a Foreign Land. Who Cares? Unfortunately, they do not have families in Bahrain to mourn for them; like those poor six girls who died in another accident horror just a few weeks ago. Thousands of miles away, in a Himalayan country, their loved ones must be still in a shock and daze at the news of these deaths. Three different families must be mourning the deaths of their sons who left their homes to earn a few dinars more. And what they got in return was horrific deaths on a highway, in a strange country. From there, in Nepal, the families cannot easily complain to anyone in Bahrain. And even if they complain, the question is, will it bring them back to life? No. But I am very upset that these poor workers had to cross a road to catch their company transporation, or to go to their accomodation, on a busy highway with high-speed vehicles. Couldn't the company not have dropped them, or picked them up, from a safer place? Is it not the responsibility of the company to ensure the safety of their workers even if it was after work-hours? Should the workers not be discouraged to cross roads over dividers on highways? Who will now compensate their families for the sudden deaths of their breadwinners? And should the car driver, who is now in critical condition at the hospital, feel the pangs of guilt all his life? Who is responsible for the mental trauma that the loved ones of the dead, and the injured driver, are now suffering from? Who? I think these are points that all employers must ponder on, and act upon. I think these are lessons to learn, by all companies using different transportation vehicles for picking and dropping workers from accident prone places. If it was in some other countries, the labour legislations such as Workmen's Compensation Acts would apply, which could have got the bereaved families some compensation. But Bahrain is way behind when it comes to legislating and implementing workable labour laws on matters such as these - especially if they have to protect expatriates.